In the last hour police in Munich have said the suspect in the shopping mall shootings is an 18-year-old German-Iranian national. He had been living in Munich for some time and acted alone, before killing himself. Nine victims are dead, including "adolescents", police say. Twenty people remain injured, including three people who have life-threatening injuries. Police say "the motive or explanation for this crime is completely unclear". Earlier, shooting began at about 18:00 (16:00 GMT) on Friday. Witnesses said the attacker opened fire on members of the public in Hanauer Street, near a branch of McDonald's, before he moved to the nearby Olympia shopping centre. 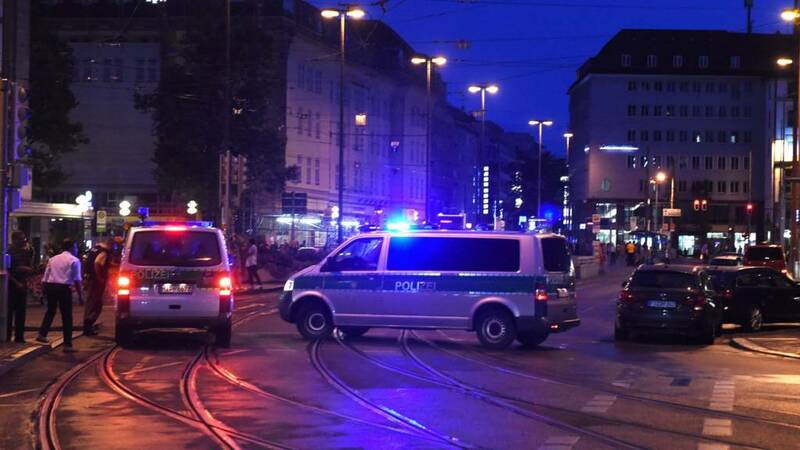 Some 2,300 police officers were deployed and a manhunt was launched, as the Bavarian capital's transport system was suspended and the central railway station was evacuated. We are now halting our live coverage for the night. Please continue to follow our main news story, which can be found here. The news conference has now come to an end. The man giving the details was Hubertus Andrae, Munich's police president. One detail he gave earlier was that 2,300 police officers were involved in the response - they included local officers, others drafted in from neighbouring regions in Germany, and also some from Switzerland and Austria. Police say "there are injured children, yes". Munich's police chief says "young people" are also among the dead, adding afterwards that they are "adolescents". Twenty people remain injured. Three people have "life-threatening" injuries, police add. Police have added that the gunman had dual nationality - Iranian-German. He was found dead in a side street in the vicinity of the shopping centre. Asked about reports the gunman shouted "I am German" while shooting, police say they have not been able to confirm or dismiss the claim and appealed for people to provide officers with video footage for analysis. The police chief has said the gunman used a handgun. Says he did not use a long-barreled gun, despite earlier reports. The two people who left the scene at high speed - and were initially thought to have been possible accomplices - had nothing to do with the shootings, the Munich police president adds. The Munich police president is giving more details on the gunman. He says he had been in Munich for "a while". When pressed he says it was for more than two years. The man was not known to law enforcement agencies. He says no links with terrorist groups have been discovered yet - but investigations continue. The motive for the shootings is unclear, the police president has said. He adds that 2,300 law enforcement officials responded to the incident. The police president says two people seen fleeing the scene in a vehicle were initially considered to be suspects. He says "on the basis of witness reports and CCTV footage" a man found dead near the scene is considered to be the suspect. Police currently believe nobody else was involved. Police say gunman was an 18-year-old Iranian man from Munich. The police press conference in Munich has now started. The local police president is speaking, and says yesterday was "the most serious and difficult" day in his career. We are expecting police in Munich to hold a news conference in the next few minutes. Police tweeted the latest updates, saying they have given a "cautious" all-clear after identifying a suspect who has killed himself. Munich police have said the suspected gunman in the attack killed himself and may have been acting on his own. The fresh information comes after earlier reports suggested there could have been three gunmen. Police in Munich are planning a press conference for 02:00 local time (24:00 GMT). They added that the city's transport network, which was shut down during the attack, had reopened at around 01.15 local time (23:15 GMT).